Rapper Kodak Black is facing backlash — and some fallout — from comments he made over the weekend about Lauren London, the longtime girlfriend of slain rapper Nipsey Hussle. During a live broadcast on Instagram on Saturday, Kodak announced his intentions to romantically pursue London, with whom Hussle had a young son. "I’ll be the best man I can be for her," Kodak said. "I’ll give her a whole year. She might need a whole year to be crying and s--- for him." He continued: "I ain’t trying to shoot [my shot] at her. I’m saying, listen. She can do two, three years. I’ll try to be like the friend if you need to holla or a shoulder to lean on. She can call my line." The comments were met with swift backlash, including from rappers The Game and T.I. and Justin Credible, a disc jockey at Los Angeles radio station Power 106, who pledged to no longer play Kodak's music. 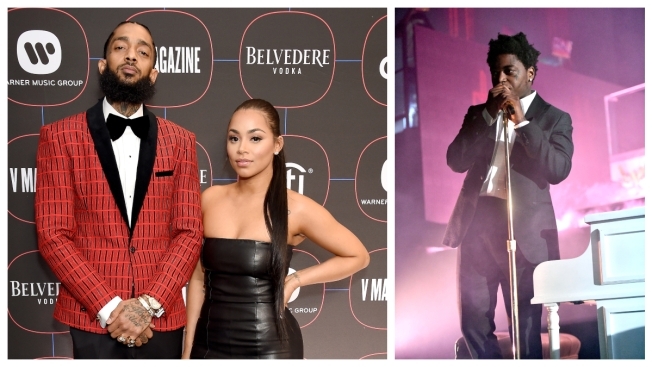 "We stand with the family of Nipsey Hussle and are appalled by the disrespectful and poor comments made by Kodak Black," Justin Credible said Saturday. "With that, Power 106 will not support Kodak Black’s music." Later Saturday, Kodak issued an apology in a live broadcast on Instagram.